We're excited to launch our first all-new app in over a year: SteadyTune, the Mac menu bar tuner. We thought we'd give you a little peek behind the scenes in this blog post to explain how SteadyTune came to be. Agile has been in the tuner business for a long time; GuitarToolkit was one of the 600-odd apps in the App Store when it opened back in July, 2008. The idea for SteadyTune was a case of scratching a slightly different itch. Most of our team are both developers and guitar players. We regularly caught ourselves launching GuitarToolkit in the iOS simulator to tune our guitars. Certainly we had our iPhones and iPads nearby, but when sitting in front of one's Mac in Xcode, it was slightly more convenient to just launch the GuitarToolkit tuner, sim and all. This got us thinking: wouldn't a native tuner app be great? And what if it were a there-when-you-need-it, out-of-the-way-when-you-don't, menu bar app? Thus was SteadyTune born. Leave Well Enough Alone? Never! We then took another detour, this time technical. One of the most difficult challenges in tuning algorithms is avoiding needle twitchiness while preserving tuning accuracy. Although we've been told that GuitarToolkit rivals the best dedicated hardware tuners in this regard, we decided to see if we could do even better in SteadyTune. In the end, we entirely rewrote the tuning algorithm, and the results—both on steadiness and accuracy—are striking. We didn't leave well enough alone, but all told we're thrilled with how well the combination of new visualization and new algorithm work together. Enhancing lives, one tune at a time. Agile and TrueFire have teamed up to bring you Lick of the Day 2.0, a big update to our guitar learning app. Lick of the Day 2.0 launches with new features and 20 new TrueFire Lick Packs spanning 500 blues, rock, jazz, rockabilly and acoustic lick lessons. The result is a rich and immersive learning experience. Each of the new Lick Packs includes 25 video lessons from a skilled TrueFire instructor, interactive tab/notation and backing tracks. Lick Packs come in sets of two volumes per genre, where the second volume builds on the concepts and techniques presented in the first. Check out the video: Lick of the Day is a free download on the App Store, and free Licks are available for each Lick Pack so you can try before you buy. To celebrate the launch, we're offering 40% off of all Volume 1 Lick Packs. Visit the contest page for full details and contest rules. Enter now! Today marks a wonderful milestone for Agile Partners and Mac guitarists alike: Agile has released its first Mac app, and AmpKit, our well-loved amp and effects app for iPad and iPhone, now has a powerful companion on the Mac App Store. 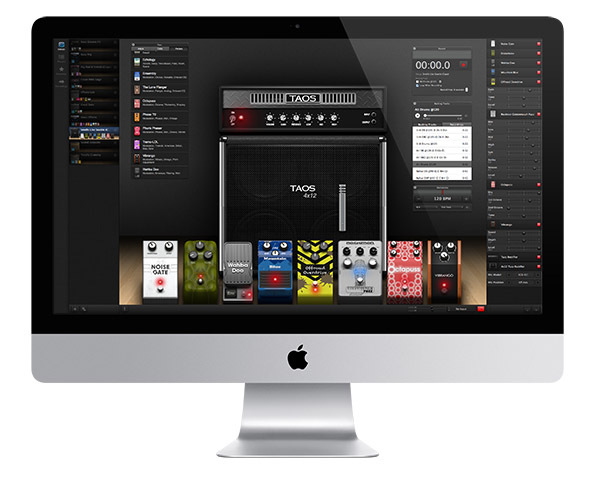 With AmpKit Mac, simply connect your guitar to your Mac using a guitar interface (like the upcoming AmpKit LiNK HD), and your Mac is transformed into a powerful amp, effects and recording studio. Check out the overview page for features; or download the demo and see for yourself. AmpKit Mac is custom-built for OS X 10.7 Lion and 10.8 Mountain Lion, taking advantage of the best new capabilities in OS X. We've worked hard to carry forward the design philosophy that has made AmpKit so easy to use, powerful, and great-sounding on iOS. We're already getting early reviewer feedback that AmpKit Mac has significantly raised the bar for Mac-based amp & effects apps. Mac users tend to greatly appreciate native Mac apps, apps that are custom-built for OS X, follow the Mac's thoroughly-documented human interface guidelines, and take advantage of OS X's unique features to deliver a superb user experience. We saw an opportunity here, since most Mac-based amp & effects apps aren't custom-built for Mac, but instead are "cross platform," built to run on both Macs and Windows machines. Most haven't optimized their user experience or performance for OS X.
AmpKit is a true 64-bit app, and its core amp & cabinet simulation code are well-optimized. 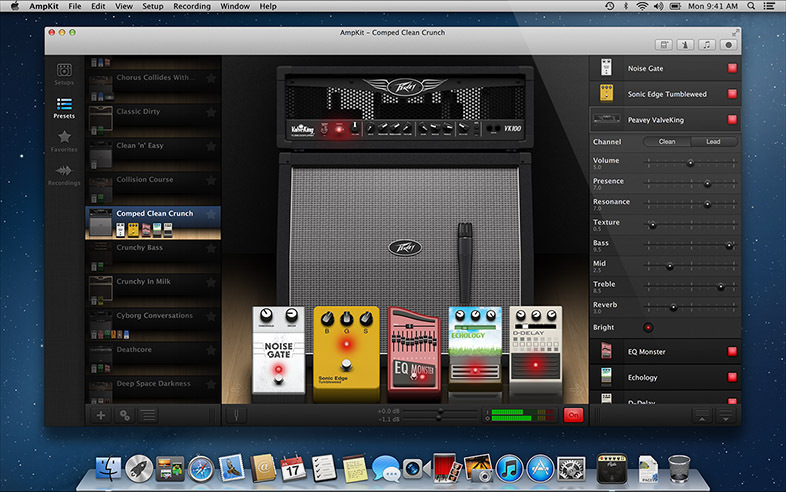 The result: AmpKit delivers amazing tone but consumes a minimum of your Mac's resources. AmpKit takes advantage of many features new in OS X Lion and Mountain Lion, some influenced by iOS. These include Multi-Touch gestures, Full Screen mode, Sharing via email or AirDrop, and gesture-enabled Quick Look. These features have a big impact on how easy and enjoyable AmpKit Mac is to use. AmpKit uses a multi-panel UI, with a main "Stack View" and separate floating panels for Gear, Backing Tracks, Recording, and Metronome. The multi-panel UI is especially useful for users with multiple displays, where it works well combined with Full Screen mode. AmpKit does all the little things that make it a good OS X citizen, from a searchable "AmpKit Players' Guide" integrated into Apple's native Help Viewer to a fully-scriptable menu with dozens of keyboard shortcuts. AmpKit is available on the Mac App Store, delivering a simple and secure purchasing, installation, and upgrade experience. The Mac App Store makes life so much simpler--no complex registration and activation process, no troublesome update managers, no intrusive anti-piracy mechanisms like USB keys. Another big advantage of AmpKit Mac is that many iPhone and iPad users also have Macs, and having AmpKit running on both mobile devices and your main computer gives you the best of both worlds: jam anytime, anywhere with AmpKit iOS, or sit down for some serious setup crafting and studio recording with AmpKit on your Mac. Since the gear available in AmpKit Mac is the same as that on iOS, AmpKit's Setup Sharing means you can easily use the same AmpKit setups on your iMac in the home studio and on your iPad and iPhone when traveling. As powerful as mobile devices are these days, it's still tough to beat a full-fledged Mac when you're ready to do serious tone design or recording work, and AmpKit Mac takes full advantage of your Mac's extra power. We use the Mac's larger display (or multiple displays!) to expose more of everything, eliminating the need to drill down to see details. AmpKit enables Full Screen mode, and even works Full Screen on multiple displays, for a truly immersive user experience. We use the Mac's extra CPU power to improve the simulation fidelity of amps, cabinets, and complex pedals. AmpKit leverages the full breadth of the Mac user interface, embracing mouse, trackpad, gestures and keyboard with equal enthusiasm. Rather than selling individual amps and pedals, we decided that AmpKit Mac should include all the great gear that AmpKit is famous for: 22 amps with 38 separate amp channels, 28 pedals, 28 cabinets and 8 mics. With this combination of powerful capabilities and a competitive price point, we're confident that AmpKit Mac will be a no-brainer for many Mac guitarists, from GarageBand users seeking more in-depth modeling options, to pro users who'd prefer to work in a truly native Mac app. Thousands of musicians have made AmpKit their go-to for jamming and recording, and we expect thousands more Mac users will do the same. If you'd like to be notified when we launch new apps or have major announcements, please subscribe to our email newsletter. Essential tools for all guitar players. App Store Hall of Fame inductee. Learn great licks in a wide range of styles. Master your chops now. Jam anytime, anywhere. The ultimate amps and effects studio. 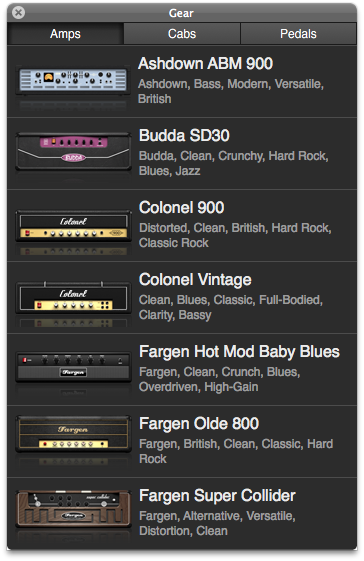 Amps and effects done right, right on your Mac. Beautiful, immersive, powerful. The menu bar tuner for your Mac. Beautiful, lightweight, instantly available. Guitar tab and sheet music player. Apple Design Award winner.